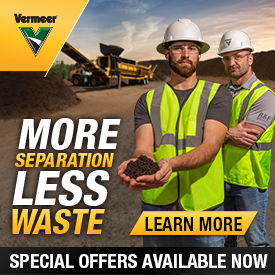 Industrial screening equipment designed to fit your production needs — we’re talking ease of maintenance, productivity and flexibility on the job site — all backed by localized Vermeer recycling and forestry specialists. That’s some serious peace of mind. And with an extensive list of options, your trommel screen can be custom manufactured to fit your specific needs. Breathe easy and get the most out of your material with a Vermeer trommel screen operating on your jobsite. Sign up to learn more and get a free pair of gloves at Vermeertrommels.com.